By my calculation, John accumulated 5 individual SAAA gold medals and 28 SCCU team golds! John Paton Robson was born in Kelso on 31st January, 1957. Like Frank Clement and Graham Williamson, he was a middle distance runner of true world class, but unlike the others, he could also be world class at cross-country and enjoyed a long running career. In his centenary history of the SAAA, John Keddie writes in considerable detail about some of John Robson’s finest track races and it seems appropriate to quote at length. John Keddie succeeded in covering John Robson’s main track successes, although inevitably the summary excluded other notable achievements, such as his other gold medals in the SAAA 1500m in 1977 and 1984. But how did his career begin? I ran for Edinburgh Southern Harriers from 1974 to 1981 and was lucky to have John as a team-mate during that period. He and Allister Hutton were absolutely outstanding, despite the fact that, by Scottish standards, we had a very good cross-country and road running team. The rumour was that John had been discovered as a promising young competitor in Borders professional races. Kenny Ballantyne (SAAA mile champion in 1964, and a 4.01.1 miler in 1965) is meant to have persuaded John to try amateur athletics and join ESH. The Borders had a strong athletic tradition and Craig Douglas was another prominent ESH man, who won the SAAA 880 yards in 1963 and the 1500 metres in 1969 and 1971. John Robson first appears in the yearbook as a Junior, in 1974. He was third in the SAAA Junior 800m and had a season’s best of 1.57.1. However in 1500m he improved with every outing and topped the list with 3.55.0. In 1975, still a Junior, he reduced his 800m time to 1.51.7; won the Senior East District 1500m; and the SAAA Junior event; as well as recording an excellent 3.47.8. The time was set shortly after my first encounter with this quiet, dignified young athlete, on April 26th 1975 when, at the tender age of 18, John ran the second (shorter) stage of the AAA National 12-Stage Road Relay at Sutton Coldfield for Edinburgh Southern Harriers. He moved his club from 23rd to 12th, recording 14.23 for slightly less than a hilly 5000m! More than 9 years older, I took our club from 8th to 4th on stage six. My 14.16 was third fastest short stage of the day, behind Brendan Foster’s record-breaking 13.58 and ESH club-mate Ian Elliot’s excellent 14.04. John’s time was 8th fastest; ESH finished the race second, only 21 seconds down on Gateshead, and ahead of Coventry Godiva, Tipton Harriers and all the other English clubs. That was the one and only time I could be worthy of a mention in comparison to this elegant, classy runner! I do not have a yearbook for the 1976 track season. In 1977, John Robson ran his first sub-four-minute mile, in 3.58.8 on the 29th of August. He also topped this season’s Scottish 800m list with 1.47.8 on the 30th of July. There was an International Match at Athens on 14th May 1978, with Scotland competing with Greece, Wales and Luxembourg. John Robson was a close second in the 1500m (3.40.7). He topped the Scottish 1500m list with his Commonwealth bronze medal time (3.35.60). In fact he had six of the top nine performances and ten of the top 20 (all below 3.44), with Frank Clement and Graham Williamson claiming five each. In addition, John ran four sub-4 miles, with the best being 3.54.3 just behind Frank Clement’s 3.54.2 on the 27th of June. 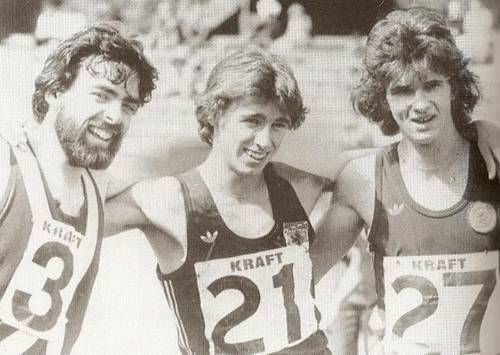 An unusual result in 1979 was in early July at Tullamore, Eire, when John Robson won both the 800m and the 1500m for Scotland during an International Match versus Denmark and Ireland. Once more, John finished top of the Scottish 1500m list, after a close battle with Graham Williamson. John had 11 of the top 20 times. Apart from UK fixtures, he raced in Brussels, Oslo, Bremen, Turin, Vienna, New Zealand and Australia. 1981 saw John Robson return to form on the track. He recorded 1.48.91 for 800m; and dominated the Scottish 1500m list with the three fastest times and six of the first eight. Single performances by Nat Muir and Frank Clement were the other two. John Robson’s best 1500m times were recorded within a ten-day span: 3.36.18 when finishing fourth in Budapest on the 29th of July; 3.37.42 for third at Crystal Palace two days later; and, on the 8th of August at Crystal Palace once again, second in 3.39.41. In Athens near the end of August 1981, John Robson easily won the 1500m for Scotland, during an International Match versus Greece, Wales, Israel and Luxembourg. In addition he ran four sub-four-minute miles: two at Crystal Palace; one in Brussels (3.53.13); and the fastest in Oslo (3.52.44). Furthermore, he was top of the 3000m list with 7.51.08 at Gateshead; and second only to Nat Muir in the 5000m rankings with 13.34.02 in Oslo. 1982 was Graham Williamson’s year, with John only managing one good 1500m time (3.37.72), which so nearly equalled Graham’s list-topping 3.37.7) when fourth at Saughton Enclosure, Edinburgh, at the beginning of July. Before that, he had won silver, behind England’s Geoff Turnbull, in the SAAA 1500m. Then, in October 1982, John was narrowly squeezed out of qualifying for the 1500m final in the Commonwealth Games in Brisbane. In 1984, one outstanding run by John Robson was his 3000m (7.45.81) at Crystal Palace on the 13th of July. In 1988, John won the SAAA Indoor 3000m title. 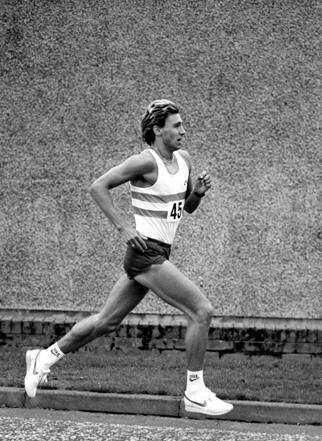 John Robson won Scottish vests for 800m, 1500m and 3000m, in 1978, 1979, 1981, 1982, 1984 and 1986. He represented Great Britain over 1500m and 300m, in 1977, 1978, 1979 (indoors and outdoors), 1981 and 1984. John also had an excellent cross-country career. In 1977 he was third in the National Junior CC, behind the precocious Nat Muir and John Graham. In the IAAF World CC Championships in Dusseldorf, Robson ran for the Senior team and finished 94th. He was back in the team in 1979 at Limerick, and improved to second Scot in 52nd place. Although he never ran as fantastically well again, John Robson had a distinguished cross-country record, since he represented Scotland in the World Cross eight times. Apart from 1977, 1979 and 1980, he took part in 1981 (Madrid), 1982 (Rome), 1985 (Lisbon, when he was first Scot in 42nd place), 1986 (Neuchatel, Switzerland) and 1987 (Warsaw). He was the leading Scot three times. In the National Senior, John Robson’s best placing was second (1980, 1982 and 1985). However he was in the top six on no less than seven occasions; won team golds with ESH five times, plus one silver; and also won team silver with Racing Club/Leslie Deans/Mizuno three times plus one bronze (in 1999). In 1986 John won the East District CC again. John Robson was in the winning team in the National CC Relay SEVEN times! Three golds with ESH; four with the ‘superclub’, plus one bronze. His final gold was in 1996. Finally, what about John Robson the Road Runner? The National Six-Stage Relay at Strathclyde Park started in 1979, but John did not take part in ESH’s winning teams until 1987. However he won five further golds with Racing Club, with his last one in 1999. In 1996 he and his brother Alan were part of the Leslie Deans RC ‘B’ team that won bronze medals! The Edinburgh to Glasgow Relay, of course, was considered the Blue Riband of the Scottish Winter season by so many Scottish distance runners. It is fair to say that John Robson’s E to G career did not start well, but he certainly made up for it afterwards! I have mentioned how fast he ran in the 1975 AAA 12-stage relay – but that was in good weather with cheering crowds. The Third Stage of the E to G can be hilly, cold, windswept and lonely. In 1976, young John ran well for a start and had just passed Paul Forbes to move ESH into the lead, when, legend has it, he began to feel strangely fatigued, then mildly despondent, and then he is supposed to have cursed loudly and thrown the baton over a fence into someone’s garden! No amount of pleading or threatening by ESH supporters had any effect, until his old mentor Ken Ballantyne persuaded John to pick the thing up and jog to the end of the stage, by which time his club was 19th. ESH finished 8th, instead of picking up silver at least. However John made amends the very next year. Into a freezing headwind in blizzard conditions, Robson ran the fastest time on the exposed Fifth Stage, handing over in second place. Eventually, ESH won gold, without Allister Hutton, and all was well! In 1978, John was best on Stage Four (almost a minute faster than his nearest challenger, John McGarva of Falkirk). Another team gold for ESH. 1981 saw John fastest on Stage Five again, with his team victorious. They were second to the USA guest ‘The Kangaroos’ in 1985, with John fastest on Stage Seven. In 1987, John was swiftest on the long leg Six but his club could only finish sixth. A year later, he was fastest on Six again, with ESH second. By 1991, Racing Club were dominating. Between 1991 and 1997, John was fastest on Stage Six twice and Stage Three once, and won seven more team golds. In my personal history of the race, I expressed the firm opinion that, of all Racing Club’s stars in the E to G, the greatest was the once-maligned John Robson, with ten golds, two silvers, a bronze and nine times fastest on a stage, often the long leg! By my calculation, John accumulated 5 individual SAAA gold medals and 28 SCCU team golds! I cannot imagine anyone else, in the history of Scottish running, getting near that total. Remember that, in his peak years, he was concentrating on International indoor and outdoor track racing! Although there was talk of him going to the USA to compete on the ‘Masters’ circuit, he does not seem to have done so, and certainly never raced for Scottish veteran titles. Surely he would have done very well in World Masters championships. John Robson was a very good team man, who ran brilliantly on countless occasions. He should be remembered as one of Scotland’s greatest-ever athletes: talented, fast, dedicated, graceful and versatile.